This workshop brought together a broad range of web and intranet professionals eager to learn more about the ideas and solutions behind semantic (Web) Technologies. The workshop was framed as a “demo and dialogue” event to better align the capabilities of IKS technology to the challenges facing “real” end users of Content Management Systems. It took place on Wednesday, 9 November 2011 within the context of the J.Boye Conference, which is an event tailored towards web and intranet professionals. 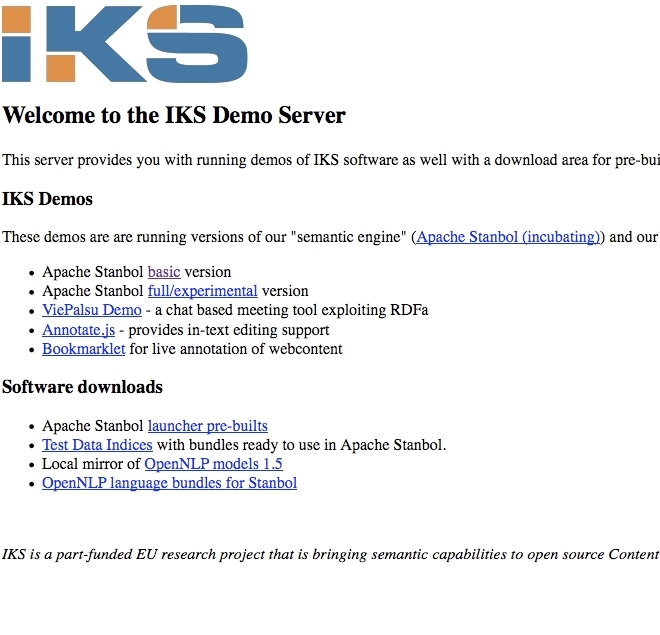 The IKS team on-hand (Andreas Gruber, Wernher Behrendt, Henri Bergius and John Pereira) demonstrated the IKS semantic engines, which provide content enrichment (rich metadata sets) based on semantic web standards. This introduced the audience to concepts such as natural language processing, named entity extraction and semantic annotations. Each demo was followed by discussion on how such approaches could address common enterprise information issues such as data integration, search and navigation. Henri Bergius in the second session provided examples of applications enabled by semantic standards and technologies. 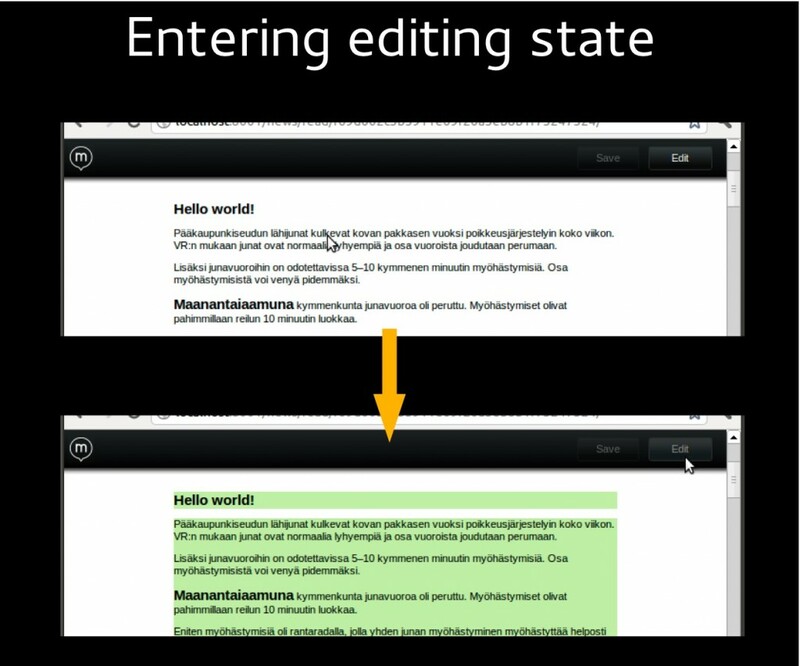 He showcased the VIE framework which utilises HTML5 and combines it with semantic annotations. There are currently two showcases: Proggis, an environment for project controlling and reporting, and Palsu.me, a web-based online meeting tool. This session was designed as an inspiration exercise to think beyond search scenarios and instead explore the possibilities of new applications once the underlying machinery is able to seamlessly share rich metadata. Henri challenged the audience to think of editing interfaces with “no forms allowed!” where the web framework and web editing tools were decoupled, and he demonstrated this through the meeting tool and the project controlling tool that use the VIE framework and ideas of Linked Data. As mentioned by Lynda Moulton in her recent blog “Why is it so Hard to “Get” Semantics Inside the Enterprise?” “…the marketplace has been increasingly active; new products emerge and discussion about what semantics might mean for the enterprise is constant. One thing that continues to strike me is the difficulty of explaining the meaning of, applications for, and context of semantic technologies.” To address this adoption barrier the IKS team will follow-up this workshop with individual discussions to put the solutions offered by IKS in a context that is relevant for each workshop delegate. The result of this, where possible, is early-adoption of the IKS technologies. This will take place within the context of the IKS Early adopter programme. We look forward to this challenge. On this note we would like to thank all the delegates for their time and interest in the results of the IKS project. Allan Nyhus, Danmarks Naturfredningsforening, Denmark; Bo Osbaeck, Danmarks Radio, Denmark; Chris Lo, International Trade Centre; Enrico Zelocchi, International Trade Centre, France; Guy Pucill, Radiometer Medical, Denmark; Hans Jakob Dyrhagen Husager, Danmarks Radio, Denmark; Jens Peter Hansen, The Knowledge Centre for Agriculture, Denmark; Jesper Overgaard, Hedensted Kommune, Denmark; Juan Vázquez Regueiro, European Patent Office, Germany; Kari Hurtola, Alma Media, Finland; Martin Risgaard, Arla Foods, Denmark; Nikolaj Agerbo Sabinsky, National Danish Police; Rune Lippert, Morgenavisen Jyllands Posten, Denmark; Simone Gross, Erster Bank Group, Austria; Spijker Gerard, KONE, Finland; Torben Sloth, Widex Marketing, Denmark; Yousef Elbes, World Health Organisation, Switzerland; and Thomas Bredgaard, Grundfos.